There are some products that once we try them, they become family favorites. That's the case with Heirloom Audio Productions. We have been so incredibly blessed to have had the opportunity to review many of their titles, including In the Reign of Terror. Heirloom Audio Productions have allowed my family to travel through time with their amazing audio adventures. These are NOT your average audio book. These are based on the books by G.A. Henty, but these are audio dramas, and are unlike anything else. I have frequently commented on the background, ambient sounds and the acting skills. The words and audio as a whole paint such a vivid image, it's as if we are truly there amidst the action! The latest adventure, In the Reign of Terror, takes us back to the French Revolution. We begin our adventure with a conversation taking place between a young boy and an older man. They are discussing the American Revolution vs. the French Revolution. The older man explains to the boy that there are vast differences between the two, that the American Revolution was a war for independence from an overpowering King and taxation, while the French Revolution was an all together different beast. The story involves a young teenager named Harry, who is an Englishman. His father sends him to live with a well to do aristocratic French family, so that he may teach the children English, and the mannerisms/behaviors of a typical English boy. The family's son, Ernest, is closest in age to Harry, and the two become good friends. In addition to Ernest, the entire family develops a deep admiration for Harry. While in France, the French Revolution breaks out. This is when we start to learn the difference between the American Revolution and the French Revolution. In France, one could, and would, be murdered just because of their blood line and association to a noble family. As you can imagine, this directly impacts the family with whom Harry now resides. In the Reign of Terror takes us through the uprising, and showcases the French Revolution as a man against man mob mentality uprising, rather than an army against army fight like the American Revolution. With the physical set of discs, we also received access to the new Live the Adventure Club during the review period. Here, you can find online streaming of the audio adventures, and bonus content. We received all content associated with In the Reign of Terror, such as the amazing Study Guide, printable Cast Poster, Inspirational Quote printable, and more. If you've not experienced Live the Adventure Club yet, I urge you to do so. The study guide is great. It is arranged by disc and track number, and it also includes the time stamp for each track so you can go right to that point if needed. The questions are though provoking and require a bit of critical thinking, at times. I found this great to use for oral discussions, as well as short answer essay questions. "What man intends for evil, God intends for good." The inspirational quote print is simple and to the point. It's a simple red background with the quote in white, and the audio drama logo at the bottom. I wish I could capture it in a small screenshot for you to see! Something I really appreciate in the special bonuses is the included script. This is really great for Mr. B to use to follow along, if he so chooses. 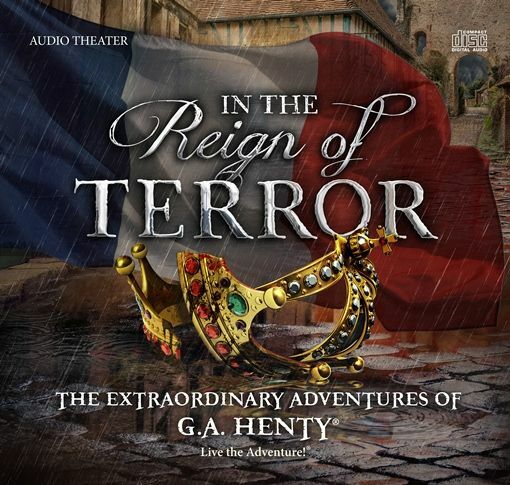 Overall, Heirloom Audio Productions has another knock out hit with In the Reign of Terror. The Christian based message makes my heart smile with joy. These adventures, especially In the Reign of Terror, are so educational, and entertaining, they are sure to be a hit! With actors such as Brian Blessed, John Rhys-Davies, Cathy Sara, Jack Farthing, Christina Greatrex, and Jill Freud, how can anyone go wrong? It's a fantastic cast for an epic adventure, for sure! Does Heirloom Audio Productions Pass My 4 Ingredient Test? You can listen to it at your leisure. We like to listen to it straight through during one of our long drives to medical appointments. We listened to all of disk one and half of disk two while on the way to OT, then we re-listened to it all on the way to mamaw's house and back for dinner one evening! The Study Guide is versatile in that you can use it in a number of ways. There are NO hidden fees. This is a physical product that kids and adults all will like. Definitely NOT boring! We love it! It's great for auditory learners, too. It doesn't last too long, because you can choose the length of time to listen. We love it here, and find it to be calming, and entertaining. It captures our attention, and holds it for the duration of the program. This would be great to work into any study on The French Revolution. The Study Guide alone can provide a wealth of information! Please be sure to check out The Homeschool Review Crew to see what others have to say!